The Shell, is a pastel work by Odilon Redon, painted from a shell belonging to his wife. This object inspired the painter to do a number of variations on the theme of the birth of Venus. There is no naked figure emerging from a conch shell in this pastel, but there is perhaps the promise of a birth. The work was only revealed to the public after the artist had died. The reproduction of this pastel doesn’t make it easy to imagine the original shade of the paper as it is powdered with muted tones of earthy yellow ochre, brown ochre, green clay. In places however, we can almost imagine through the grain, that the colour of the paper is an indistinct grey. Moreover, the position of the shell seems to have been especially reserved for it in order to give the impression that the subject bursts out of the virgin background without warning. And so might the filigreed substance of a dried insect’s wing, and especially on the upper lip of the shell, emanate from scratches of white pastel onto an area of paper not covered in pastel, and therefore rough. In contrast, heavy droplets of white pastel are spread here and there, mineralising the shell’s fragile structure. Set between the two half-open lips of the shell, generated by a reddish mauve that is at the source of two misty atmospheric shadings, an area of flat white tint. This area looks like it’s been cut out of stone and echoes the rusticity of a Romanesque sculpture of a child swaddled in a crib. Another flat white area glides, like a moving curtain, over the sun-bathed resonances of the lower lip until it loses itself in the blue-tinged edge. To exalt the luminosity of the chalice, the golden brown harmonies of the background are enhanced and enshroud it with a halo. The purplish-blue projected shadow, deepened with black, propels the mother-of-pearl effect from its exterior point, a rough protuberance worked in half-tints of grey over the powdery obscured background. An umber brown caterpillar climbs up the bright mountain slope, and the sharp black line that edges the floating undulations of the corolla, isolates it from the background like a precious object presented in a velvet case. In the bottom right-hand corner, the strangeness of a small spiky multi-spine shell punctuates the composition like a signature. The substance of its carapace, extracted notably from the yellow ochre background, resonates on the area of accentuated brown pastel. The black ring outlining it, nonetheless just as sharp as the large shell, weakens slightly, mingling into the dark background. 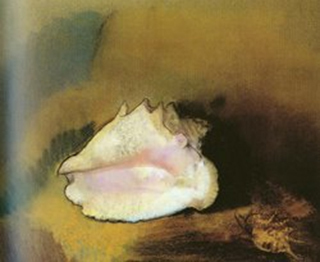 Clam shell, bathed in light, and strange little monster shell, upside down in the mystery of obscurity, are reunited here in a silent work, the reverie and phantasmagoria of the secret world of Odilon Redon. This entry was posted in FAQ Art & Pastel and tagged interaction background and subject in painting, Pastel by Odilon Redon, Text by Marie-Lydie Joffre, The Shell on January 31, 2016 by mljblog.